Several years ago, I put a trellis in my garden where I wanted to grow roses. I did not succeed. After giving up that attempt I planted amaranth there. 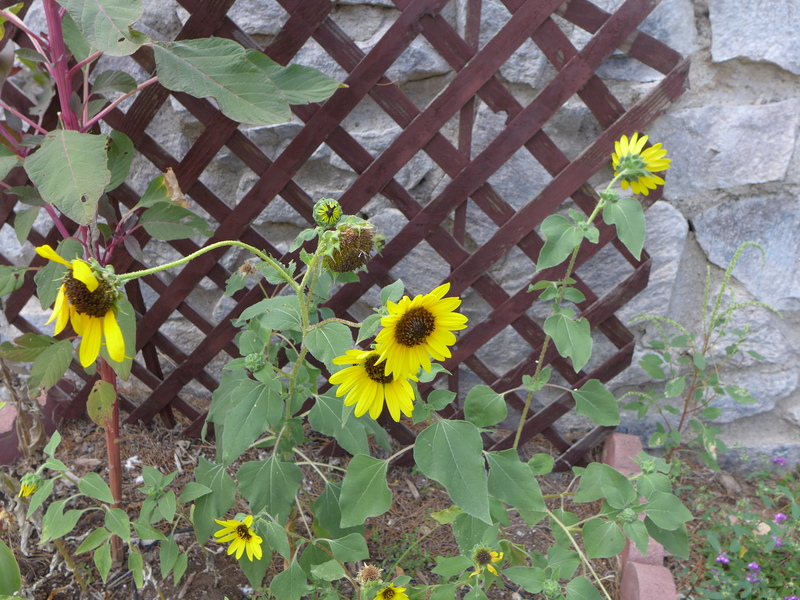 A few plants survived; when I returned from vacation they were bent over, going to seed. The next year I planted a few sunflower plants there. A few of them survived. They had competition from a few amaranth volunteers, which, like the year before, bent over. One was worth staking for a while. This year I planted nothing in that section of the garden. Several sunflowers volunteers came up. They had reverted to a smaller, more native look. And there have been lots of them. 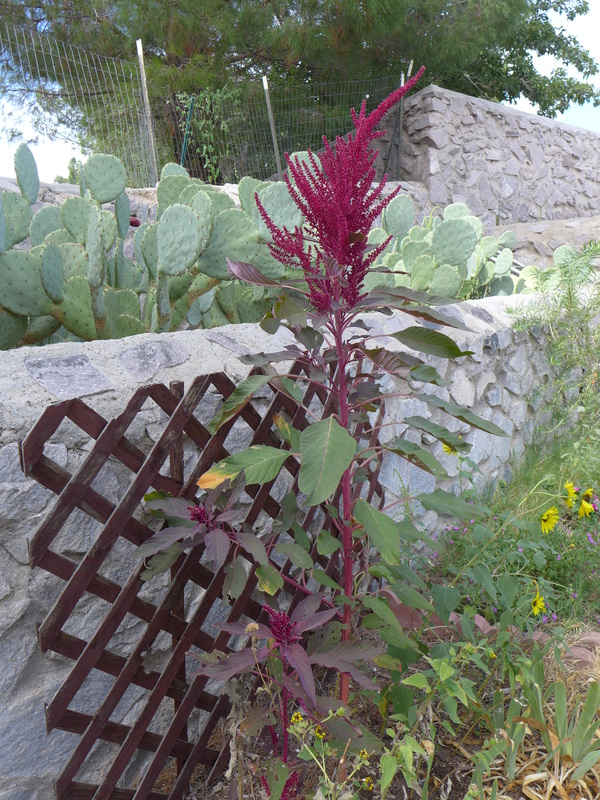 Several amaranth plants also appeared. Nothing special at first. Now, at the end of the season, a giant appears―a giant which is also absolutely straight. Nature has taken its time to do far better than I can. At the opposite side of my yard I have a red-trumpet-flowered bush with dark green leaves. I bought it three years ago, and I have had to prune back the bushes on either side to keep them from crowding its space. It is blooming abundantly this year. Unfortunately I have lost the papers from my purchase and I can’t remember what its name is, or what feeding and pruning I should give it. This week I took a piece of it with me to a small flower show. I found a piece of the same plant in one of the bouquets on exhibit. I asked around. 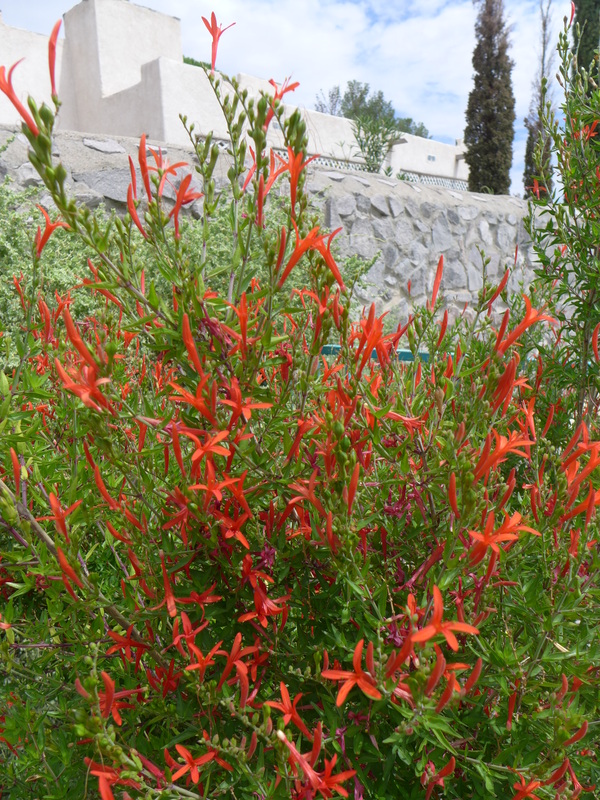 Some people thought it a Cardinal flower (lobelia cardinalis). Others suggested a salvia. The flower tube opens up into four equal narrow petals―unlike anything I can find on Google or in my native plant book. I guess I will have to keep calling it Red Trumpet Flower Bush. Gardens are our teachers: they point out the limits of our powers and plans, they astound us with their unpredictable flourishing, they grieve us with their disappearances, they delight us with their resurrections.